Grid orientation can have a significant effect on strength, so it is crucial that you are sure it is being placed correctly. 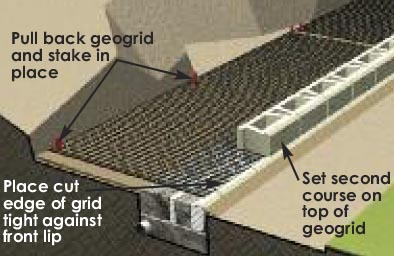 Typical commercial geogrid is uniaxial and strong in the roll direction and should be placed in sheets perpendicular to the wall facing. If you are using biaxial grid, you don’t have to worry about this and grid can be rolled out in either direction. If using uniaxial grid, cut geogrid to designed embedment length and place on top of the block units to within 1 in (2.5 cm) of the retaining wall face. Extend away from wall approximately 3% above horizontal on compacted infill soils. Placement of adjacent sheets of geogrid should be side-by-side without any overlap.